Weather this week, could best be described by what it wasn’t. It wasn’t Hot or cold, it wasn’t really rainy or stable, it wasn’t really windy, and mostly, it wasn’t very good for getting the walleyes to all do the same thing at the same time. Today, my boat caught walleyes in front of weed beds, on deep water summer structure, on transition points, in 35 ft., and the kids caught walleyes off the shore lunch beach from 5 ft. of water. 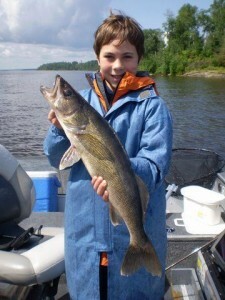 The walleyes were everywhere – sort of. There was a weed bite this week, but only certain weeds. On average, we tried 10 known quality weed beds to find one OK bite and one good bite. There were a few fish found deep, but they were tough to catch and there weren’t many small or medium sized fish with them to keep you busy while you waited for a big one. Most active areas this week would be considered transition zones; areas that walleyes temporarily stage at in mid depth zones before heading out to main lake summer spots. The difference this year is that most of those fish appear to be coming back to transition spots after having been out on main lake sand. It is a definite head scratcher. Water levels finally changed directions for the first time this year. The lake level dropped about an inch in the last few days, because the Lake of the Woods water control board has increased the outflows to the highest level since 1959. 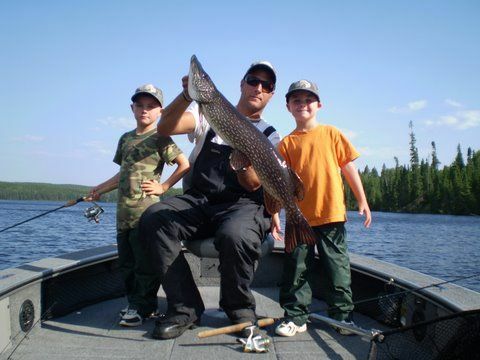 The plug has been pulled and though I know it is causing a great deal of hardship to those downstream, it is none too soon for Lac Seul. Just an average storm with high winds at this level, would send sand banks and trees into the lake. There has already been a significant loss of shoreline in many places. It is family time in camp with lots of family groups with kids. In the evenings, there are kids playing ball in the yard, hunting tadpoles in the bay, and catching walleyes off the dock. It does shift the focus for the guides a bit. Volume and action become much more important than searching for a trophy. 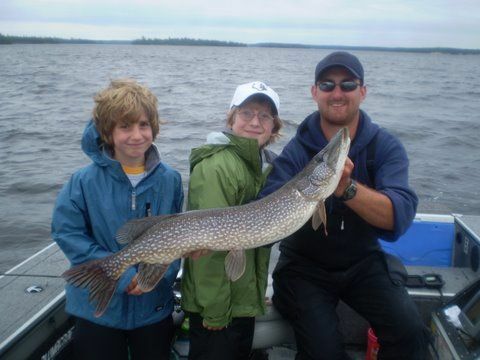 Kids want the rod bent and all the guides know it. There will be plenty of time later for them to worry about Big fish. 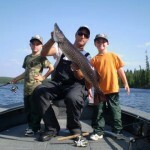 We all know that the most important thing is to ensure that they get a positive and fun introduction to fishing Canada. 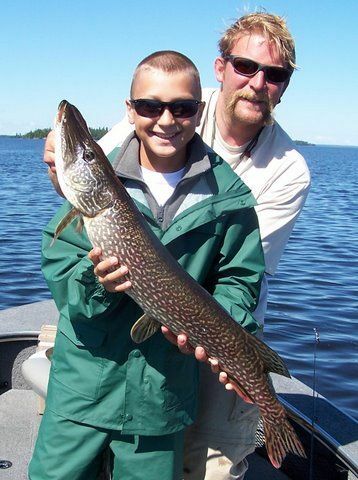 There were groups in search of big walleyes this week and they did have a tough time. 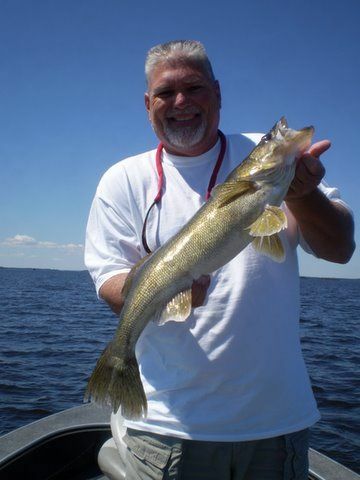 As has happened in the past, when we get a separation between the weed bite and the deep water bite, the big ones become difficult to catch. 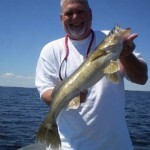 For the week, we had 13 walleyes over 27 in., including 2 over 28. 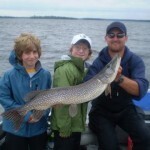 Volume was patchy, but guide sheets averaged 30 walleyes over 18 in. per day. The highest daily total was 66. We ran bouncers and spinners, but they just didn’t produce nearly as well as jigs. Sizes ranged between 1/4 and 3/8 oz. depending on depth and the quality of the bite. 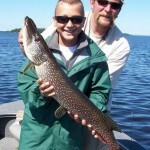 Pike and Bass were incidental catch and really not worth mentioning.